A cold April did not give way to a warmer May, as each of the four full-season Boston Red Sox affiliates finished at least five games below .500 in the second month of the season, despite Pawtucket, Portland and Salem each going on four-game winning streaks. The system's top two prospects, Jay Groome and Michael Chavis, remain out of the lineup, Groome due to Tommy John surgery and Chavis due to testing positive for a banned substance, but others in the Red Sox system have stepped up and had strong months to try and help their teams. 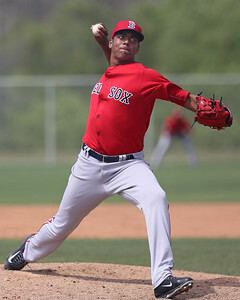 Santiago Espinal (pictured, right) and Denyi Reyes (pictured, below) earned SoxProspects.com's Player and Pitcher of the Month, respectively, after putting up solid performances in Salem and Greenville. Espinal did it with a steady performance near the top of the system in many statistical categories, while Reyes was able to lead the way among pitchers in a litany of categories. Espinal jumped all the way from No. 29 to No. 15 in the June 1 SoxProspects ranking update with a .346/.393/.580 slash line in the month of May, good for second, fifth and third among qualifiers. He was also second with five home runs. A shortstop who has played some second base since entering the system, Espinal got his first start at third base recently, as it looks like he will see action around the infield with the return of CJ Chatham to action on defense. The 23-year-old was a 2016 11th-round pick from Miami Dade Community College South and has improved in his slash line from each season to the next, going from .244/.340/.267 in 2016 in the Gulf Coast League to .280/.334/.358 in 2017 for Greenville. This year, he has six home runs, which is already a career high. As for Reyes, he was tops in the system in many important categories such as innings pitched, ERA, WHIP and batting average against. He also struck out a system-leading 37 batters to only four walks in 38 1/3 innings. His WHIP was 0.79 and allowed batters to hit only .191 against him. Reyes, 21, is in his first year of full-season ball. After playing in the Dominican Summer League in 2015, he spent 2016 in the Gulf Coast League before heading to Lowell last season. He was signed as an international free agent in 2014 from the Dominican Republic and has succeeded at every stop up the ladder with a similar formula of limiting baserunners, especially via the walk. He entered the rankings for the first time this year in May's rankings at No. 51.